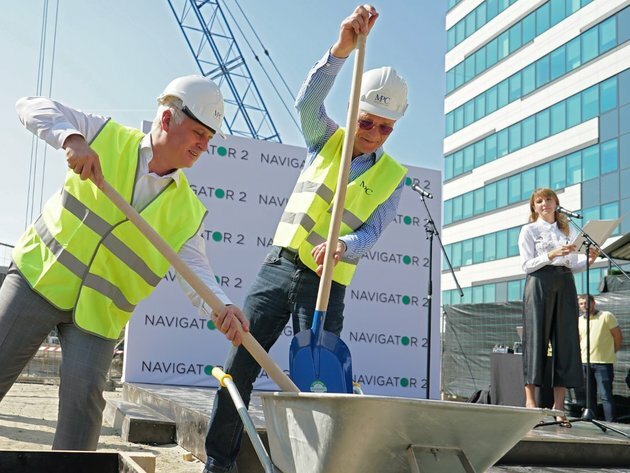 The official laying of the foundation stone for Navigator Business Center 2, a new A-class business facility in New Belgrade, marked the beginning of another important project of MPC Properties. The investment is estimated at over EUR 45 million, and the facility should open in the first quarter of 2020. Navigator Business Center 2 is a modern, sustainable A-class business building, which consists of an underground garage with three tiers and 500 parking spaces and nine floors, including the ground floor, and it is designed and is being built in line with the LEED standards of green building. Located in the center of the business area of the city and very well connected with key city locations, only 15 minutes away from the Nikola Tesla Airport, Navigator Business Center 2 will take up 50,000 square meters, of which 27,000 are to be rented. The name of the facility points to the fact that this is the second phase of the existing business complex, Navigator Business Center, which is already an attractive business destination in the city, standing apart thanks to its location, its authentic architecture and its modern concept. – The real estate market in Serbia is a great potential for the development of the whole region, and as the biggest investor and the leading company for the development of real estate in this part of Europe, we recognize this very well. We have estimated that now is the ideal moment to build new facilities and, with this investment, we are responding to the demands of the market and the lessees for a business facility which can respond to all the challenges and needs of modern business – Ingo Nissen, the director of MPC Properties, said on this occasion and added that the company’s strategy was to build quality, sustainable facilities in line with the principles of green building. – The first phase of Navigator Business Center has already obtained the LEED Gold certificate and the applied concept has already produced concrete results in the form of lower operating costs. The construction of the second phase will further complete and enrich this business zone in terms of content. I have to thank the city administration for the excellent cooperation during the realization of this project, as well as the speed with which the necessary issues were obtained – Nissen pointed out. The ceremony was attended by Deputy Mayor of Belgrade Goran Vesic, who said that the investment was another important confirmation that Belgrade is becoming an attractive business destination. – With this project, our city will get another excellent business facility, which will be a good incentive to economic activities in the country. As a city, we will continue to invest in these efforts and create a good environment and a good business climate for investors, being aware of their needs, so that we would issue authorizations and permits quickly and efficiently, thereby further inciting them to invest their funds in our city – Vesic stated. Navigator Business Center 2 is another important investment in the portfolio of MPC Properties, next to the USCE Shopping Center, Mercator Center Belgrade, Usce Tower I and II, Navigator Business Center, as well as other business and commercial facilities, built in line with the highest global standards. The new business facility will be managed by Confluence Property Management.